VM800B modules are ready solutions for applications equipped with a touch display. 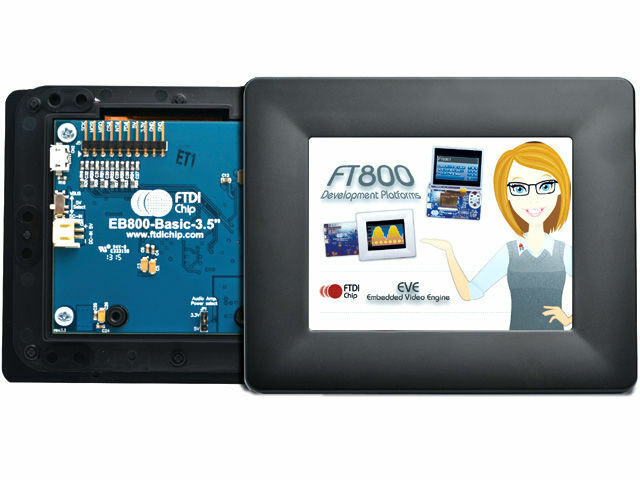 They are developed on an innovative FTDI’s FT800 EVE circuit – controller of TFT graphic displays, touch displays and audio. Thanks to such configuration, to develop an application, it is enough to have a microcontroller with SPI interface. Modules are equipped with esthetic frame, thanks to which they are suitable for mounting directly on a ”panel” without using additional enclosures. VM800B35A-BK Module: EVE FT800; SPI; speaker, audio amplifier; LCD, TFT; 3,5"
VM800B35A-PL Module: EVE FT800; SPI; speaker, audio amplifier; LCD, TFT; 3,5"
VM800B43A-BK Module: EVE FT800; SPI; speaker, audio amplifier; LCD, TFT; 4,3"
VM800B43A-PL Module: EVE FT800; SPI; speaker, audio amplifier; LCD, TFT; 4,3"
VM800B50A-BK Module: EVE FT800; SPI; speaker, audio amplifier; LCD, TFT; 5"
VM800B50A-PL Module: EVE FT800; SPI; speaker, audio amplifier; LCD, TFT; 5"